Brancusi’s Bird in Space is the material expression of this vision. He eliminated all superficial likeness, attempting to apprehend the sensation at the core of flight. The smooth gleaming shape seems to reach upward, defying gravity. It suggests a continuing trajectory into the space above it. Look, up on the pedestal! It’s a rocket, it’s a flame, it’s… supersculpture…. Well, actually, Bird In Space is what this gleaming bronze sculpture is really called. But where’s the bird? Where are its wings, its tail, its beak? Instead of creating a recognizable animal, sculptor Constantin Brancusi took the idea of a bird and transformed it into art. 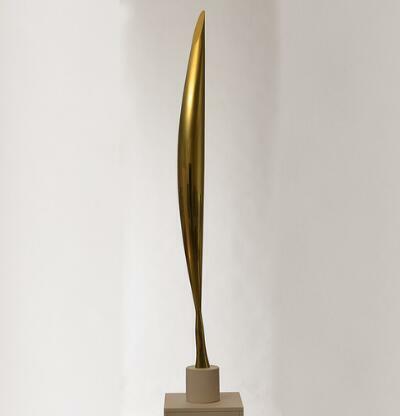 He once said, “What is real is not the external form, but the essence of things.” So how does Brancusi express the essence of a bird? Well, walk around and look at this sleek-as-a-rocket sculpture again. What does it make you think of? Many people think it gives a feeling of upward movement, of something rising, maybe about to take off and soar. What do you think?